Amherst’s historic train station has a new lease on life. On Jan. 29, Town of Amherst officials, VIA Rail officials and Jeff Bembridge of J.E. Bembridge Enterprises signed five agreements that will result in Bembridge developing a restaurant in the station. The agreements will see the town purchase the 111-year-old station, which was closed in 2012, as well as a portion of Station Street and the adjacent parking lots from Via Rail. The town in turn will rent the property to Bembridge via a five-year, lease-to-purchase agreement that will see ownership of the station turned over to Bembridge at the conclusion of the deal. “This has been a long time coming, but it is finally here and it’s a great day,” Mayor David Kogon said of the deal that took more than three years to negotiate. vocation to one of Canada’s most beautiful railway landmarks,” said Yves Desjardins Siciliano, president and chief executive officer of VIA Rail. Bembridge said he was excited and scared to death, all at the same time. “This is a big adventure,” he said, adding his plans are set and he is ready to start the renovations the moment he obtains the keys to the station. 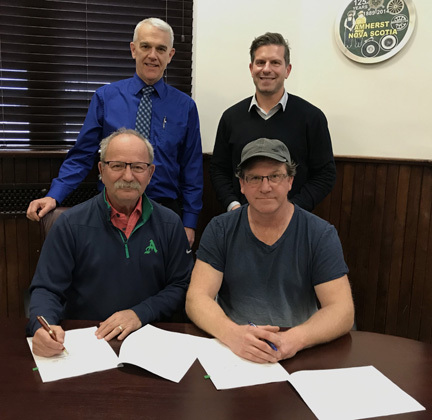 As part of the deals, the town has declared the station a Municipal Heritage property, which means no demolition or substantial alteration to the exterior of the building can take place without the permission of the Town of Amherst. The designation does not prevent the interior from being renovated. The town has also agreed to rent space within the station to VIA Rail – trains still stop at the station if they are taking on or letting off passengers in Amherst - so passengers will have a waiting room and access to washrooms. This lease will be taken over by Bembridge when he assumes ownership of the building. The deals close on March 1. The town will spend up to $7,000 to install a new furnace in the building, but during the five-year, lease-to-purchase deal, Bembridge will pay the town a total of $64,980 plus HST in monthly installments. Upon the conclusion of the deal, the town will begin to receive tax revenue from Bembridge. “This is a pretty good economic deal for the town,” Kogon said. “The town gets just under $65,000 from Bembridge over the length of the deal and after five years, we will begin to receive tax revenue from that property, while only spending $7,000 for a new furnace.